Every arc starts with a screencap in mind for the climax. You have NO idea how long I've been waiting to use this sequence. I know that feeling, Twilight. I hate those too, though only slightly less so than when the GM explains the obscure loophole in your plan and the BBEG seems to uncannily use it to defeat your plan. With most of my plans, the loop-holes are kind of obvious... It's my job to stop the loop-holes... I just stand in the middle of it... that's how I usually die. I try to put a curtain or something over mine. Blocks line-of-sight but does nothing against bullets. Well, saying that, it was Twilight who assumed that the hydra's appearance would be advantageous in the first place. If anything, that's just reiteration of the lesson to be learnt about assuming expected behaviours of anyone, player or NPC, in a tabletop RPG. I know that feeling all too well. I once had a plan to hit a boss for massive damage involving a familiar and a backpack full of magic explosives. The boss was inexplicably immune to fire. Tell me about it. The one time we ever came up with a strategy in our group was with our very first adventure. We had tracked members of a prohuman group called the iron circle to a house in a field. I came up with a brilliant plan. Our two stealthy hobbits and our one human would infiltrate their tavern. Our archer would hang back in a tree with fire arrows to take out the tavern and bridge while the rest of us would be around the tavern if and when the stuff hit the fan. The stealth mission failed, but all members of the iron circle died in a massive fire. To cover our escape I tell the archer to burn the bridge and... "it's made out of stone and wood." Everyone was pissed for the rest of the short session. I had an experience somewhat like that. In a game I played years ago, the guy running the show seemed to have something against me. Whenever I made a plan, whether I consulted with others before hand or not, it failed, and whenever I went in without a plan I got chastised and told I should've planned. Haven't played with that guy since. Good riddance. As a GM many times over, I know the feeling. It usually comes from that moment when the PC's have inexplicably found a way of defeating your carefully laid plan and carefully prepared bad guy in minutes, turning what was supposed to be an epic Final Combat into a Total Curbstomp. The temptation at that point is to give the bad guy some kind of special invulnerability so they can continue. But if the PC's catch on, they start to resent it, and the enjoyment fades fast. So the trick is to just accept it and move on. Ultimately, the whole story you're telling is more important than any single encounter. Even a boss fight. Rainbow Dash and Applejack are having another one of their arguments, again. Let's end the debate once and for all. Who really is the Iron Pony. Well we know that Pinkie is the bravest of the lot, considering that she was the one to be near the need that covered AJ & RD without a bit of protective clothing, but as for Iron Pony? Rarity works with gems, found in the ground much like iron. I still have to say Derpy, however, because she destroyed a building by flying into it. If she's not made of iron, then what? Rainbow might be the fastest *flyer* but Pinkie is probably the fastest Pony. Speed isn't everything though, I'd probably have to go with AJ. As for Iron Pony, definitely Applejack. The ony way Dash can beat her is with wings. The "Iron Pony" would be Iron-Pony. Right? (Iron-man + Pony = Iron-Pony?)... Somepony, make/find a picture of that, stat! I think it should be obvious. If you're asking who's the strongest physically, it's Big Mac, no question. Who is Iron Mare? Only Twilight could make the arclight. Who is the one to really be scared of? Fluttershy. Just ask the dragon, cockatrice, and Discord. FanOfMostEverything, awesome. My pick is the one's with helmets on/ no certain identity. Tatsurou, I agree with you 100% with Fluttershy, probably a reason why she is my favirote. If Raxon was a pony, he would win. I say she should break out a lighter. Odd; I'd pictured her eyes glowing, the lights dimming, and her foaming at the mouth with a Lesson Zero-ish twitchy-eyed smile while eldritch voices chanted Black Speech from an unseen void, to balance realism with terrifying the PPPM. Come to think of it, anypony know the name of Lovecraft's abominations' language? Ry'loth is a place, Yog-Sothoth and Cthulhu are monstrous entities, and then I'm tapped. Prolly oughta work on that; could be fun for My Little Villains. Everyone knows Derpy is made of derponium. I fear the atomic #/ weight of whatever element that is, also, is it radioactive? The atomic number is -4. It is only radioactive when near muffins. I thought it was atomic number 6+9i (Complex atoms can only occur in high-magic environments.) It's only radioactive when no longer exposed to muffins, though, at which point it starts emitting frightening amounts of gamma rays. Uh, gamma rays are high-energy photons as a result of atomic decay or destruction. They are radioactivity. Years back I used to collect the D&D plastic minis. When they released the collossal mind-blowing red dragon figure, my mind was... well blown. 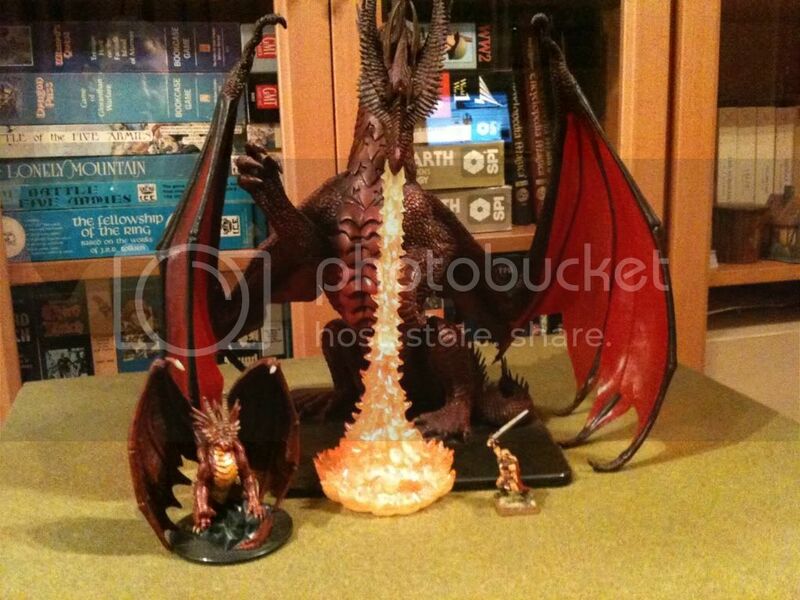 I bought it and hid it in storage because I knew that my D&D game at the time was getting to the final battle, and the BBEG dragon had to have this astronomical figure's form. I plopped that figure from it's hiding spot onto the battle mat. Dropped down his highest ranking personal guards and spellcasters, and then cue'd up the final boss music from Final Fantasy 8. My players figuratively peed themselves. That final battle lasted a little over Twenty rounds and resulted in TWO heroic sacrifices on the PC side to prevent a TPK. Twice. So yeah, sometimes when I get a grand idea for a final climax, it's worth the wait. You know the saying: "Pics or it didn't happen"
Seriously though, I have no point of reference. How big was this mini? Size of a cup? A computer? A person? Fair question! Okay, a standard mini to represent a medium-sized creature has a 1" base and stands no more than 2" tall. Damn! That was the final boss battle? What's the creature size on that? It's colossal sized, although I think the base is one square larger than to provide stability. The fire breath is a neat removable piece too. I sometimes use it as a prop to represent a Wall of Fire. Not sure why the url didn't correctly post. Maybe it didn't like quotation marks. I will probably never see the pic, but if it is as it is described, HOLY &%#$, THAT'S TERRIFYING! I'd be afraid of that thing in real life if it was either actual height or in comparison height. I wound up using that "mini" for my PC last session as i was Wildshaped into a Roc and was under the effects of an animal Growth spell and that was the only one my new size. That thing is huge, and by huge I mean colassal, and by colassal I mean "RUN FOR YOUR LIVES, IT'S THE REINCARNATION OF BAHAMUT, OR THE EVIL ONE, RUN!" Ah, yes, the Colossal Red... I have a Gargantuan Blue, myself. Shame I've never really gotten an actual game going, or else it probably would've seen use by now. Much obliged; the recordings are fun, but more time-consuming than I can afford until after midterms. TWILIGHT SPARKLE evolved into RAPIDASH! TWILIGHT-DASH or RAPI-SPARKLE, the laws of 5th wall physics states that any one comparison + another another can't be one or the other, but combined to the awseome both. TWILY SPARKS evolved into RAINBOW DASH, you picky person. The phrase you're looking for is portmanteau. I always knew Twilight was a huge flamer. Fo sizzle, yo. I'm surprised nobody shows any emberthy for Twilight's boiling frustration. We need an incinderstanding between friends here. We can't just have everypony be coal afterwards, we needed a tempered dialogue. After that, we can move on, and sail where the wind bellows. Friendships will be forged in the heat of battle. If you ignore this, I'm gonna be steamed. Well, it's too cold to hold my nose and run screaming outside. So I think ignoring you as if you hadn't said anything is the second-highest accolade for a series of puns that bad, isn't it? Um Uh Er I mean "Brave Sir David ran away, Bravely ran away away! When Raxon made some awful puns, he - eh, buck it. Is tiem for sleep. Dude chill, your puns are getting everyone hot under the collar. You truly are a pyronoclast, Raxon. The pyrony of your statement just burns me up. Yes well that realization was just a flash in the pan. Sorry about the glacial pace of the response, I was frozen out of my account for most of the day, but it's all cool now; everything's frosty. Raxon, every time I see another one of your posts on here, I just think to myself how nice it is to have such an old flame still going for this comic. It just burns me up to imagine that anyone wouldn't want to keep reading once they've started. You, my good sir, keep the spark in us going just as much as Newbiespud himself - even if he's the one with enough of a flaming passion to keep making the comic. And I'm just ignored. Dang that is cold. No, none of us are really left out here. We're all still carrying to torch here, after all. Twilight's fire-face somehow looks Squidwardish. One time my party was hired to recover an ancient artifact that had been stolen from a religious order. It had been loaded onto a ship, and we were working with an NPC bounty hunter to get it back. We spent something like twenty minutes coming up with plans, from "Have the rogues sneak in from above" to "Have the rogues sneak in from underwater" to the tried and true "Blow the thing up and grab what we want later". We were just about to settle on "Send in the rogues, have them grab the statue and as many other valuables as they can find and book it" when the DM announced that the bounty hunter was gone, followed shortly by an explosion. Then we had to book it because for whatever reason there was a bunch of undead in the hold and they'd somehow survived the explosion. That flipping bounty hunter has been the cause of every problem since we got to that continent. If we ever get back to our reality, then the dwarf and I are going to go through with our plan to kill her in her sleep.